Created the Supreme Court as well as superior and district magistrate courts. Established the Alaska Public Employees' Retirement System (PERS). Passed the Alaska Lands Act. Created the seal of the state. Set the drinking age at 21. Permitted women serving as waitresses in restaurants to serve alcohol. Established numerous professional licensing boards. Established a minnimum wage of $1.50 an hour. As federal government functions transferred to Alaska, policymakers were optimistic that federal transitional grants, existing funds, and the opportunity to select 104 million acres of land, would be enough to fund the transition to statehood. 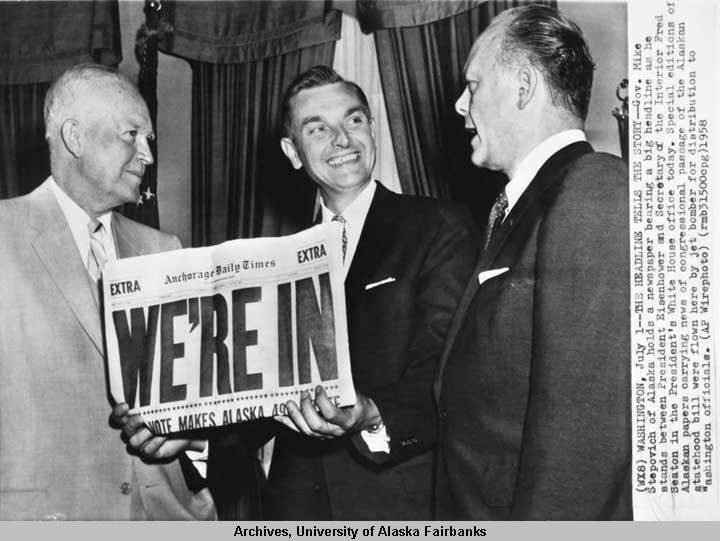 The governor and lawmakers soon realized, however, that statehood brought higher costs than had been anticipated and, in 1960, the Legislature together with the Alaska State Planning Commission completed the first accurate financial assessment of the new state government. While the next Legislature would need to address the financial crunch, the promise of oil and gas discoveries in Cook Inlet and an expanding timber industry offered some bright spots. First major gas discovery in Cook Inlet. First competitive offshore Cook Inlet lease sale occurs in 1959. State's petroleum revenue increases to almost $10 million in 1960. On February 20, 1960, the Governor appoints Nora Guinn as the first Native magistrate. First optical laser is operated at the Hughes Research Laboratories in California. USSR's Sputnik launches carrying two dogs.